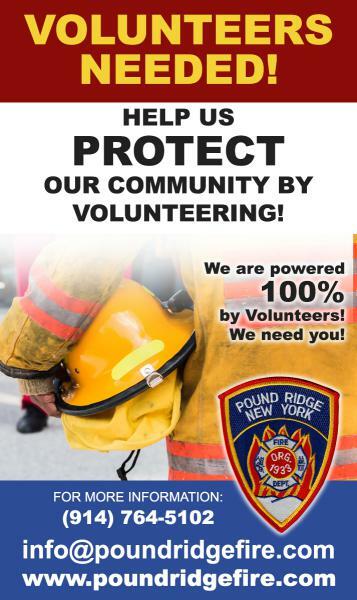 The Pound Ridge Fire Department has been a 100% volunteer organization since inception in 1933. Because people donate their time, we are able to provide fire protection to the residents and businesses of Pound Ridge. We also support the surrounding area by providing mutual aid when the need arises. We are always looking for volunteers. If you would like to participate, please consider stopping by and fill out an application or contact us via e-mail at dept@poundridgefire.com. We offer free training as well as the opportunity to give back to the community. Let us also say thank you to all those who have donated monetarily. Your continued financial support is greatly appreciated.